Aluphone Concert Travel | Aluphone - Tuned percussion for percussionists. 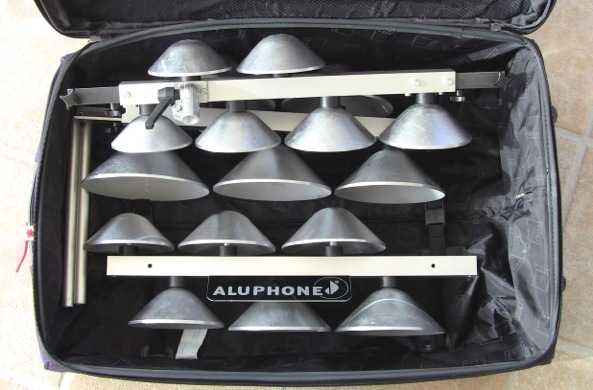 The Aluphone Concert Travel is a two and a half octave chromatic set of Aluphone Bells and a great choice for the touring percussion player. It is our most popiular model and several major works has been written for it. It is the same instrument as the Aluphone Concert, but it can be taken appart in smaller pieces for easy transport. You can divide it into five parts and it fits easily into you baggage. You can bring it on your next fligt, the weight is only 18 kg. The instrument comes with an adjustable mounting system (the same as for the Aluphone Concert), designed for use in conjunction with regular cymbal stands. Flexible height and angle adjustment make it perfect for use with other percussive instruments in a multi percussion setup. Cymbal stand are not included. Bring in on the flight in your baggage. 18 kg and most flights allows 23 kg. Have a safe flight!